Your General Admission Ticket gains you access to Times Square on Dec 31st. Please make sure to have your ticket with you upon arrival in Times Square. You will need to show it to any security if needed. Please enter event at 50st St and 6th Ave between 7:00PM-11:30PM and 12:15AM-2:00AM (as regulated by NYPD.) Admittance restrictions may be in place during the Ball Drop (11:30PM - 12:15AM.) Regardless of admittance time to your party, make sure to enter the Times Square area no later than 8pm. Enjoy reserved seating within the Mezzanine for the duration of the event (Mezzanine VIP ticket holders stand). Only persons holding Mezzanine Seated VIP tickets will have reserved seating. Mezzanine Seated VIP tickets accommodate any size group (no minimums required – pending availability). Your Mezzanine Seated VIP Ticket gains you access to Times Square on Dec 31st. Please make sure to have your ticket with you upon arrival in Times Square. You will need to show it to any security if needed. Enjoy reserved table seating within the Mezzanine (Mezzanine VIP Access ticket holders stand). Each guest at a Mezzanine Ultra VIP table must be a Mezzanine Ultra VIP ticket holder (ticket price is per person). Your Mezzanine Ultra VIP Ticket gains you access to Times Square on Dec 31st. Please make sure to have your ticket with you upon arrival in Times Square. You will need to show it to any security if needed. Please enter event at 50st St and 6th Ave (North) between 7:00PM-11:30PM and 12:15AM-2:00AM (as regulated by NYPD.) Admittance restrictions may be in place during the Ball Drop (11:30PM - 12:15AM.) Regardless of admittance time to your party, make sure to enter the Times Square area no later than 8pm. Each guest at a Mezzanine Platinum VIP table must be a Mezzanine Platinum VIP ticket holder (ticket price is per person). Your Mezzanine Platinum VIP Ticket gains you access to Times Square on Dec 31st. Please make sure to have your ticket with you upon arrival in Times Square. You will need to show it to any security if needed. All general admission benefits (including open bar). Enjoy reserved seating in the Clubs VIP room (GA ticket holders stand). Each Club Seated VIP ticket holders shall have a reserved seat for the duration of the event. Only persons holding Club Seated VIP tickets may use reserved seating. Club Seated VIP tickets accommodate any size group (no minimums required – pending availability). Bottle service or cocktail service for Club's Seated VIP ticketholders is not included. Your Club Seated VIP Ticket gains you access to Times Square on Dec 31st. Please make sure to have your ticket with you upon arrival in Times Square. You will need to show it to any security if needed. Each guest at The Club's Ultra VIP table must be a Club Ultra VIP ticket holder (ticket price is per person). Celebrate by the DJ and dance floor. Your Club Ultra VIP Ticket gains you access to Times Square on Dec 31st. Please make sure to have your ticket with you upon arrival in Times Square. You will need to show it to any security if needed. Bottle service and mixers at your table (quantity depends on group size - please refer to the bottle chart for specific information). Difference between Ultra and Platinum tables are the number of bottles, please refer to the bottle chart. Each guest at a Club Platinum VIP table must be a Club Platinum VIP ticket holder (ticket price is per person). Your Club Platinum VIP Ticket gains you access to Times Square on Dec 31st. Please make sure to have your ticket with you upon arrival in Times Square. You will need to show it to any security if needed. Please enter event at 50st St and 6h Ave between 7:00PM-11:30PM and 12:15AM-2:00AM (as regulated by NYPD.) Admittance restrictions may be in place during the Ball Drop (11:30PM - 12:15AM.) Regardless of admittance time to your party, make sure to enter the Times Square area no later than 8pm. Enjoy reserved seating in The Den's VIP room (GA ticket holders stand). Each Den's Seated VIP ticket holders shall have a reserved seat for the duration of the event. Only persons holding Den's Seated VIP tickets may use reserved seating. Den's Seated VIP tickets accommodate any size group (no minimums required – pending availability). Bottle service or cocktail service for Den's Seated VIP ticketholders is not included. Your Den's Seated VIP Ticket gains you access to Times Square on Dec 31st. Please make sure to have your ticket with you upon arrival in Times Square. You will need to show it to any security if needed. Each guest at The Den's Ultra VIP table must be a Cellar's Ultra VIP ticket holder (ticket price is per person). Your Den's Ultra VIP Ticket gains you access to Times Square on Dec 31st. Please make sure to have your ticket with you upon arrival in Times Square. You will need to show it to any security if needed. Each guest at a Cellar's Platinum VIP table must be a Den's Platinum VIP ticket holder (ticket price is per person). Your Den's Platinum VIP Ticket gains you access to Times Square on Dec 31st. Please make sure to have your ticket with you upon arrival in Times Square. You will need to show it to any security if needed. Access in and around Times Square controlled by NYPD. Please enter events between 8:00PM-11:30PM and 12:15AM-2:00AM (as regulated by NYPD.) Admittance restrictions may be in place during the ball drop (11:30PM - 12:15AM.) Regardless of admittance time to your party, make sure to enter the Times Square area no later than 8:30pm. * Gratuity is NOT included with your purchase. Mandatory gratuity may be applied. Gratuity is applied per-bottle, not per-person. Live it up this New Year's Eve with an epic blowout at TGI Friday's located in the center of New York City's Times Square. With a trademark that celebrates everyday like it's Friday, you'll be partying amongst an exhilarating crowd throwing nonstop party vibes. For the maximum NYE experience in Times Square, dive head first into the heart-racing festivities TGI Friday's has to offer. 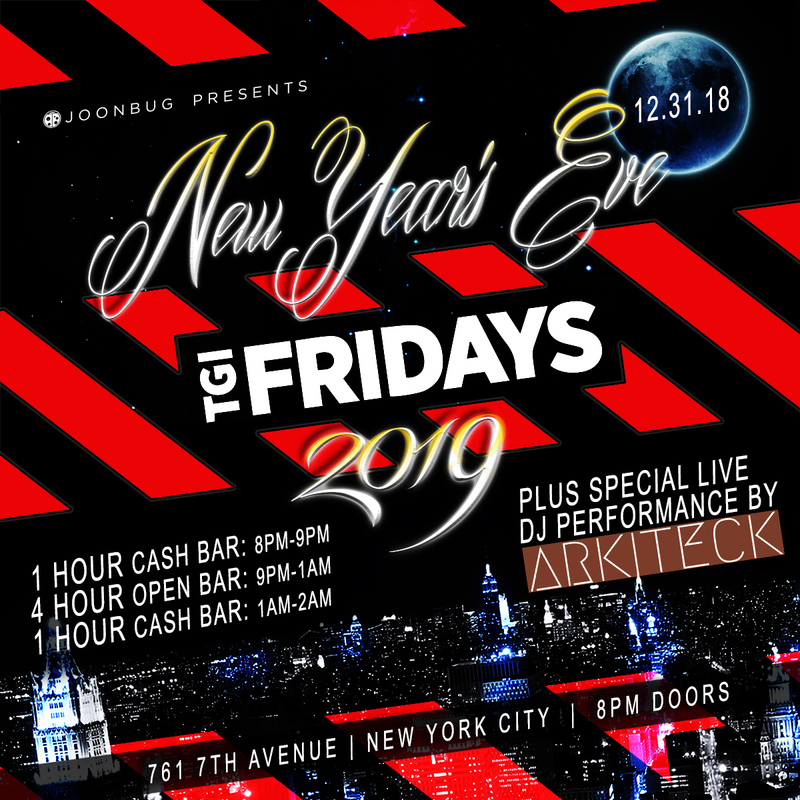 You'll discover a prime party spot at TGI Friday's coupled with that traditional restaurant feel for an unrivaled NYC affair that'll surpass your NYE expectations. Within Times Square's multi-leveled dining venue, you'll be offered first-class amenities that'll kickoff your New Year's into full gear. Enjoy the perks of a 4 hour premium open bar with top-shelf spirits offering your favorite TGI Friday's drink choices. For dining options, you'll be served complimentary early evening passed hors d’oeuvres featuring some of the most popular menu items. With an electric mix of Top 40, Hip Hop, House and Mash Ups spinning by a live DJ, you'll inevitably find yourself busting a move on the dance floor in celebratory style. Partake in the heart-racing live countdown of the Times Square Ball Drop that'll be streaming live through massive screens, and welcome the arrival of the New Year with a complimentary champagne toast. TGI Friday's includes an array of VIP packages from Ultra VIP to a Couple’s Champagne VIP Package that'll best suit your party preferences. While exuding the pizzazz of the vibrant urban scene of NYC, TGI Friday's of Times Square still maintains its All-American ambiance that so many find comforting. Flaunting traditional American decor and down-to-earth vibes, you'll find yourself sipping spirits and noshing on appetizers in an immense dining area surrounded by HD TV's and the buzz of Times Square. Embellished with oak panels and trademark ruby accents bedecked in holiday cheer, cozy up at America's favorite chain restaurant for a heart-warming NYE with the finesse of NYC. Reserve a spot at the only destination in America that glorifies the weekend, and take your NYE to new heights at TGI Friday's amidst the exalting aura of Times Square.